Glen Abbey Apartments were newly constructed in 1996 on Erinvale Golf Estate and have been continuously conducted by the German owners. The spacious apartments are nestled in a beautiful and peaceful garden, overlooking the first hole of the Erinvale Golf Course. Along the first fairway you will discover the sparkling saltwater swimming pool for those leisurely holiday pursuits. Visit South Africa and Enjoy a Relaxing Golf Holiday! The diversity of the country will fascinate you. We look forward to meeting you! South Africa is an ideal destination for golfers and nature lovers. A holiday trip to the southern tip of Africa is an unforgettable experience. Top-class golf courses in the immediate vicinity of Cape Town allow you to spend a varied golf vacation in South Africa. Erinvale Golf Estate is located in Somerset West, just 30 minutes from Cape Town International Airport (CPT) and about 40 minutes' drive from central Cape Town. The Helderberg overlooks the town, where there are also a variety of excursions in addition to various shopping centers and recreational opportunities. A visit to a vineyard in the immediate area round off your perfect holiday. Just a quick note to say thank you for a lovely stay at Glen Abby! The cleaning service was great! The Golf Estate is more than 260 acres in size and is located at the foot of the 1,137 meter high Helderberg. 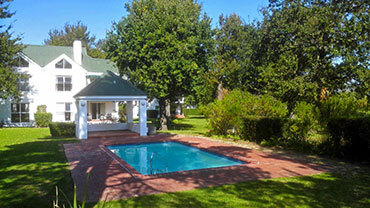 Erinvale (the Irish Valley) is located in Somerset West next to the wineries Vergelegen and Lourensford. The internationally famous Golf Estate is surrounded by the South African wine region and is a great setting, not only for golf vacationers. Golf, nature and wine culture converge in an unique way. The Erinvale Golf Course in Somerset West is one of the most beautiful golf courses in South Africa. The 18-hole golf course was designed by Gary Player Design Company and in 1995 hosted the Golf World Championship. A clubhouse with pro shop, driving range and putting green complete the golf range. Of course, lessons can be booked at professional golf instructors. The golf course is a real challenge for any golfer. The first nine holes are built on flat terrain. Hole 10 to 18 are on a hilly environment with unique views that distract from the pure golf. The greens on the Erinvale Golf Course are huge and well designed. As with all good golf courses, this course also offers a mix of short and long holes. From some of the fairways you have a spectacular view of False Bay, the surrounding mountains and of course to the Cape of Good Hope. On the whole course you can gaze out over the vineyards on the surrounding hills, which are illuminated by the African sun. At the entrance to the Golf Estate are restaurant, pub, spa and hairdresser located. A short distance away, in the center of Somerset West, there are food stores with fresh fruit and vegetables in stock. 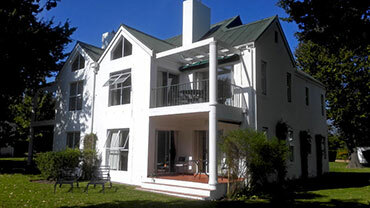 The Golf Estate is an ideal starting point for exploring the entire Cape Peninsula. Even a visit to Cape Town or Stellenbosch, the second oldest town in South Africa is recommended. As the Helderberg Nature Reserve bordering the terrain, in the beautiful surroundings you can also hike. The nature reserve covers an area of 363 hectares and was established in 1964. In particular, for the unique flora of Protea and Fynbos the Helderberg Nature Reserve is known. In nearby town of Strand there is also the possibility to walk on the longest white sand beach of South Africa or swim in the shallow waters of False Bay. Somerset West is only about 50 km East of Cape Town and has a population of about 50,000. The town is the commercial and residential center of the Helderberg region. Somerset West was named after Lord Charles Henry Somerset in 1819, who was working at the time as governor of the British Cape Colony.